I was lucky enough to be the wedding photographer for Tracy and Ians wedding at St Josephs RC church in Newcastle upon Tyne, it was a dry autumnal day and friends and family gathered from around the country to celebrate with the happy couple. Tracy and Ian decided that they would like their special photos of the day to be taken on the Quayside just next to the Millenium Bridge, these folk are enormous fans of Newcastle United and are completely passionate about all things Geordie so it's only fitting that we have the greatest landmarks of our region in as many photos as possible. I would like to wish Tracy and Ian a long and happy marraige together and a wonderful honeymoon. 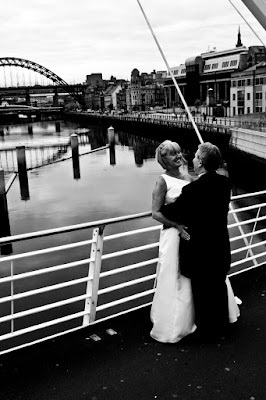 Brides, are you getting married in central Newcastle upon Tyne, would you too like your photos to be taken on the Quayside? 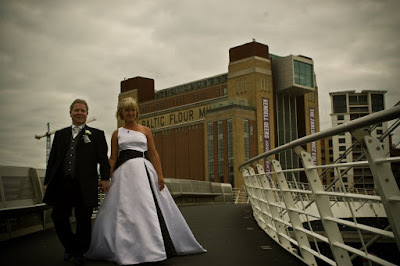 Well why not check out the wedding packages at Mandy Charlton Designs.